Contact the pastor or another minister active in your church. This kind of personal connection is important. You or someone on your team can share about a past abortion, faith related struggles after the procedure, and how abortion recovery was such a blessing. Most pastors are not sure how to address the issue of abortion. Some fear hurting or alienating those that had the procedure. Your personal sharing will be a valuable education about the issues women and men struggle with after the procedure. It can also open the door to a ministry partnership as you assist the pastor in reaching out to those in the congregation hurting after abortion. 4. Create an uncluttered, engaging, easy to navigate website so people can learn about your ministry. Donors are often interested in helping out with such a project and a tech savvy person from your church community could assist with set up. 5. Connect with the local Christian radio stations in your area – and some national shows as well. Let them know you have women and men who can share about abortion loss and recovery – this is especially helpful around the time of the March for Life, Mother’s Day and Father’s Day and for Catholic Christians in the month of October (Respect Life Month) when media are more open to our message. 6. Social Media Cultivate a current team member, volunteer, or alum from your abortion recovery ministry to help develop a social media presence on Facebook, Twitter and Instagram. Once you get the hang of it this is an effective way to create brief messages and images to promote recovery resources and share about your ministry. 7. Tear-off flyers on church bulletin boards, pamphlets and drop cards that provide info on your website and contact number. 8. Contact your local churches, seminaries, and catholic/Christian educational institutions. 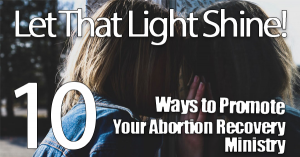 Let them know you are available to share with their students and ministers-in-training about abortion loss, the ways this can impact women and men, and the road to recovery. This is a great way to help them better understand and reach out to their future congregations. 9. Connect with the campus ministry and pro-life groups at secular colleges in your area and offer to come share your testimony with the students, how to best reach out to abortion minded students based on your experience, and resources for recovery for those that had abortions. Come together regularly as a team and pray for God’s Spirit to give you wisdom, discernment and patience. Consider becoming part of the Silent No More Awareness Campaign and find women and men in your area who are called to speak out about abortion loss and recovery. This is a great way to find support and network with others in your area and nationally that share a heart for this outreach. Keep in mind that people often need to hear messages about abortion loss and recovery multiple times before they are ready to take that next step, and reach out for help. It can be years before that seed you planted bears fruit. This entry was posted on Friday, July 6th, 2018 at 11:26 am	and is filed under Uncategorized. You can follow any responses to this entry through the RSS 2.0 feed. You can leave a response, or trackback from your own site.